This could cause a smell, sometimes an allergic reaction and can lead to legionnaires disease. Xpress Garage and Tyres offer a comprehensive aircon service from just £70.00 including VAT. 1. Visual Inspection: Our experts take a look for leaks or damage within your air conditioning system. 2. Air Con Compressor Checked: The AC compressor is looked over along with the other components to make sure that is is operating properly. 3. Old Refrigerant Removed: The old coolant is completely taken out of the vehicle. 4. Clean Refrigerant Added: The air con is recharged by adding fresh refrigerant with a special dye so that we can detect any leaks. 5. Final Check: The final checks are made to ensure that your air con is working properly. Don’t do what most drivers do, which is waiting until their A/C fails before servicing their vehicle. You need to ensure that there is enough refrigerant to run the air con system. Leaks cause the refrigerant to escape without cooling the air properly. Also, a special oil keeps the air con lubricated and the seals maintained so to avoid costly repairs, the refrigerant and oils need to be serviced. We recommend recharging your air con once every 12 – 18 months. Below you will find an image of a typical car AC system. 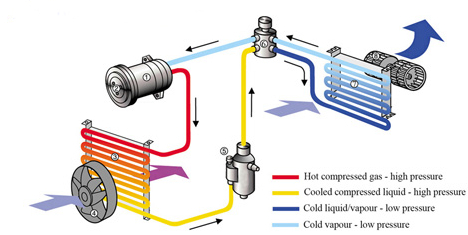 It details the way it works and the things we will look at when servicing your car air conditioning.